I’ll bet I know what you were expecting me to say…. Well, that’s not it! I was going to say that I am sicker than Sheldon (The Big Bang). The beginning of the flu episode is below. Coincidentally, I watched it this week. The funniest part was when Howard forgot the protocol from the last time Sheldon was sick. Bela came into the bedroom where I was playing dead. 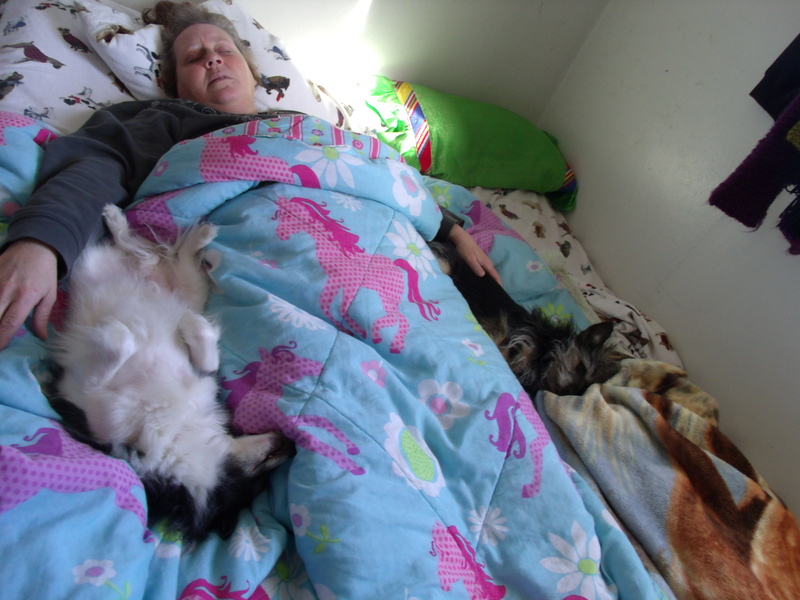 She took a few pictures of me and the pups. Let me start with Monday, though…. I was feeling crappy Monday evening with a sore throat that had bugged me all day. I came home and was in bed by seven. Yes, 7:00. I managed to work Tuesday, but not yesterday or today. According to the doctor, I’m out until Monday. All of the time spent horizontal allowed me to ponder a few interesting things….like why do the pups have to sleep with their butts touching me? Why is it so difficult to make it from the bed to the potty? That was as far as my thoughts went before I nodded off. I woke up and concluded that those little dogs sure did keep me warmer than I would have been by myself. I also concluded that the bathroom was almost too far away. Bela said I looked dead. That’s almost how I felt.